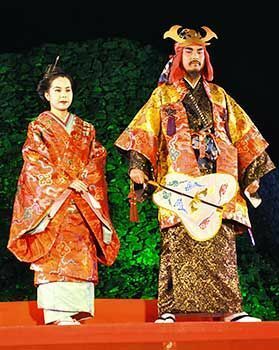 A thirty-eight year-old Genki Taguchi and twenty-five year-old Nozomi Uema have been chosen to be the sixth-generation Hokuzan king and queen, who will promote Nakijin village. The unveiling ceremony for the king and queen was conducted at the eleventh Nakijin Gusuku Cherry Blossom Festival on January 27. The king and queen will appear in photography events on February 11 and 12, as well as other various events to promote Nakijin. The Nakijin Gusuku Cherry Blossom Festival will be held until February 12.